There are some fights that last for as long as people remember. People who do not get along, things that simply do not work together. We have plenty such rivalries in our own home, with the animals we keep around. Mice fear cats, because they eat them. Cats, in turn, fear dogs, because they are usually larger and have both bark and bite. But who do dogs fear? Dogs fear the dog-catcher, of course! In a test of wits, speed and courage, man and beast face off for the ultimate prize – freedom to stay and roam the streets. 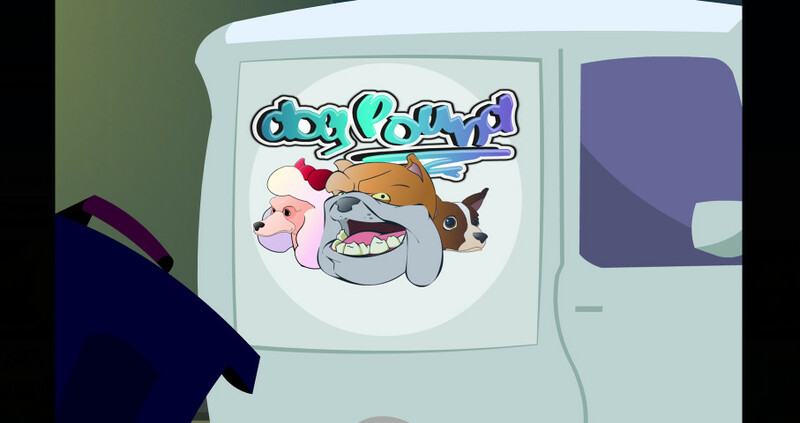 Will you help the local pooches evade capture? Or will you side with the dog catchers in Rival’s release? 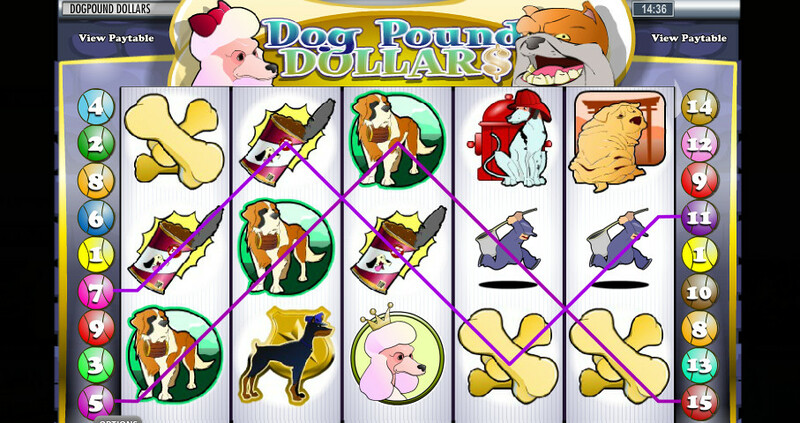 Dog Pound Dollars is a relatively simple video slot which centers around stray city dogs and their desire to avoid capture by the dog-catchers. We are not entirely sure exactly when this game came out. Some information we found dates it as far back as 2006, and given the visuals, we are inclined to agree. The symbols do not look blurry, but they are overtly simple, designed for much lower internet speeds and less powerful hardware. After watching the intro video that plays at the start of this title, we were somewhat let down that this is how it actually looked. The user interface very much so does its best to copy physical machines, although this is standard for older Rival Gaming slots. 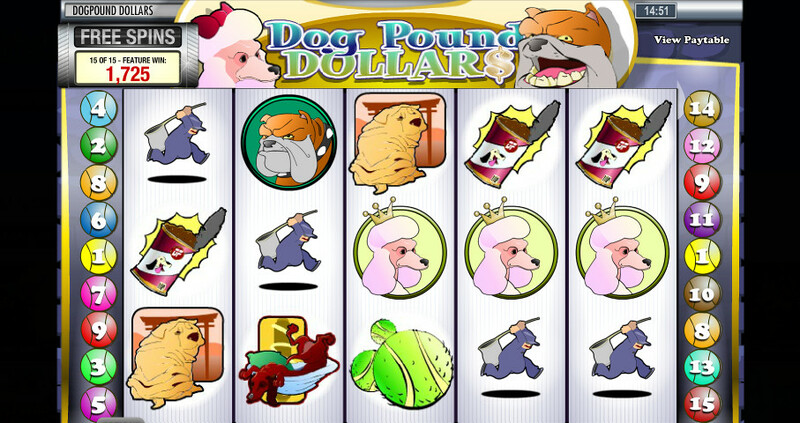 Dog Pound Dollars is played on a 5×3 playing field with 15 flexible paylines. This allows some gamblers to turn several or nearly all paylines off in order to lower their minimum bet, at the price of decreasing their chances of forming winning combinations. The RTP for this game is 95.37%, which is standard for this genre. Players can adjust the amount of coins per payline, the value of said coins, and how many paylines are active. This allows them to set their wagers between $0.01 up to $75 per spin. If you are feeling lazy, worry not. 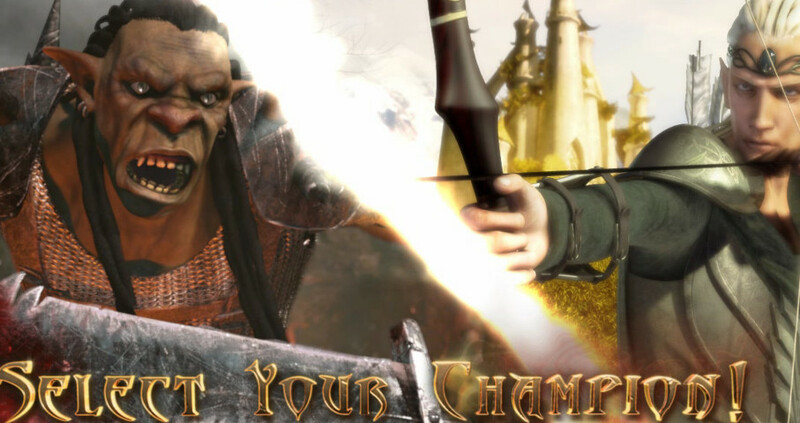 This Rival Gaming title grants you access to its Autoplay function, but only if you are playing with real money. Simply set how many spins you want to play, and the Autoplay will do the rest, spinning until all rounds are played out, or you run out of money. All winning combinations pay left to right, and are awarded by collecting three or more identical symbols that follow one of the active paylines. 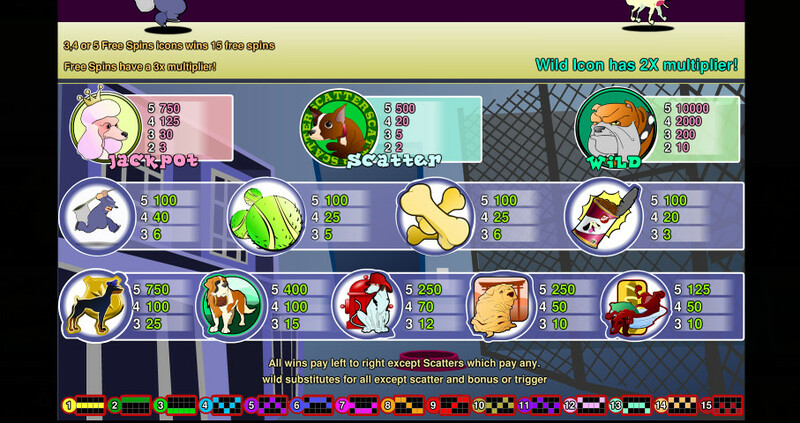 Special icons, the Jackpot, Scatter and Wild, can give pays with only two icons present instead of just one. Wilds are the most valuable symbol, followed by the Jackpot, then Scatter, then a police dog, an alpine dog, a firefighter dog, a fat dog, a sleeping dog, a dog-catcher, tennis ball, bones, and an opened can. 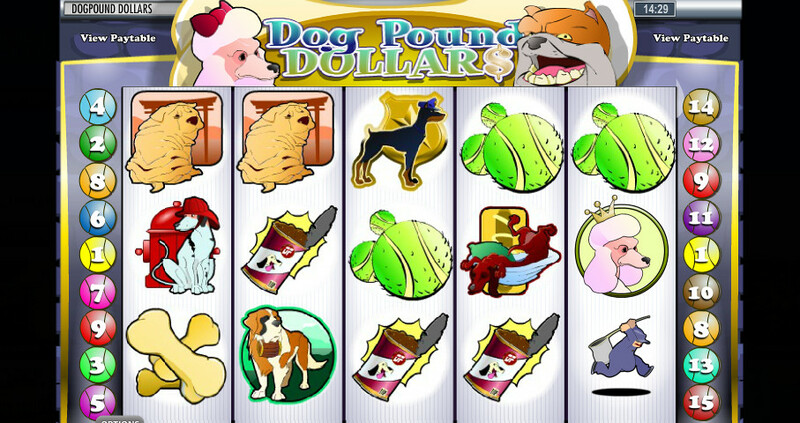 The first special feature available to gamblers are the free spins. To trigger them, collect three or more Chihuahua Scatters. This will reward fifteen free spins, and on top of that, you get a 3x multiplier for all wins made during this bonus. Wilds perform the same function they always have replacing all other icons except for Scatter symbols. What makes these Wilds different is the 2x multiplier which is applied to all wins that Wilds are a part of. 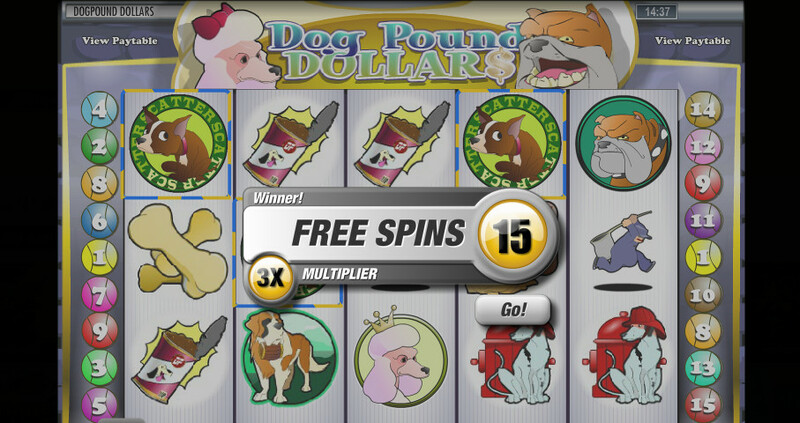 This works alongside the free spins, meaning you can have a 6x multiplier boosting a winning combination.